Hotel Attraction was to be the tallest building in New York at the time and was designed by architect Antoni Gaudi. The planned total height was 360 meters / 1181 ft and was probably unrealistic for its time. Little is known about the origins of Hotel Attraction and was unknown until 1956, when a report called “The New World Called Gaudí” was published. Interesting Fact: The drawings by Gaudi of the Attraction Hotel had actually been proposed as a basis for the rebuilding of the Ground Zero project in Manhattan. 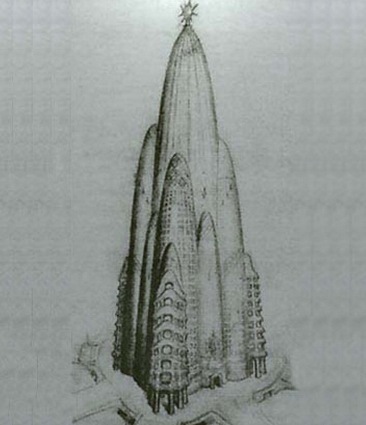 The Illinois was a proposed mile-high (1,609 meters/5,280 feet) skyscraper, envisioned by Frank Lloyd Wright. Wright believed that it would have been technically possible to construct such a building even at the time it was proposed. The design included 528 stories, with a gross area of 18.46 million square feet. Interesting Fact: A number of problems occurred in Wright’s design of The Illinois including space that was needed to service the elevators which would occupy all of the space available on the lower floors, thus defeating the purpose of the building’s height. 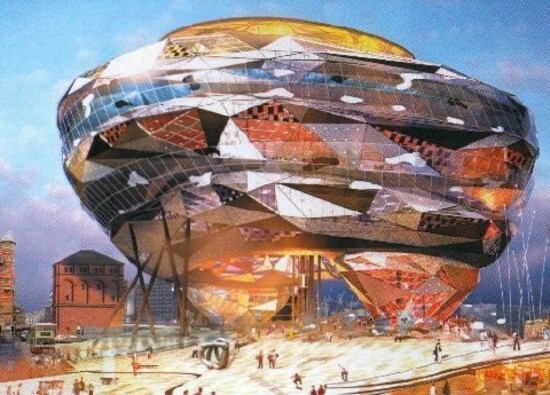 Despite what many believe was the ugliest of all the proposals, architect Will Alsop entered the winning design for this project and named it “The Cloud”. The projects name (Fourth Grace) is due to the development being located adjacent to the three historic buildings at the Pier Head site known as “The Three Graces”. The project was cancelled in 2004 due to spiraling costs. Interesting Fact: The Fourth Grace was designed for office space, a 107-room hotel and 50,000 sq ft of community facilities, including a bar, restaurant and viewing gallery. 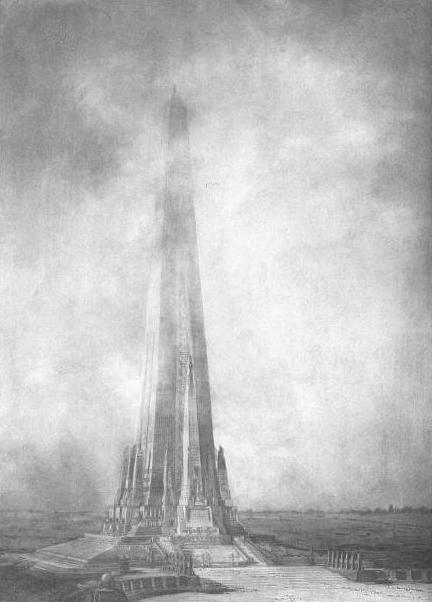 Plans called for a 457 meters / 1500 foot stone tower in Jackson Park, Chicago, on the site of the 1893 Chicago World’s Fair. French-born architect and MIT Professor Désiré Despradelle came up with the winning design. 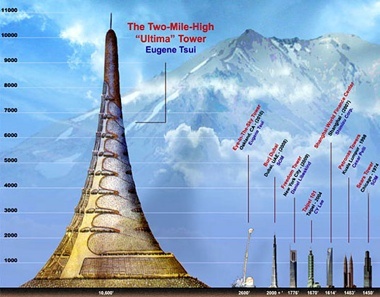 With more financial backing the structure would have been by far the tallest man-made object in the world. Interesting Fact: The design called for an amphitheater at the base to seat 100,000 people and sweeping piers that would extend into Lake Michigan for regattas. The Ville Contemporaine was to house three million inhabitants and was designed by the French-Swiss architect Le Corbusier. The centerpiece of this plan was the group of sixty-story skyscrapers built on steel frames and encased in huge curtain walls of glass. They housed both offices and the apartments of the most wealthy inhabitants. At the very center was a huge transportation center on different levels that would include depots for buses and trains, as well as highway and an airport at the top. 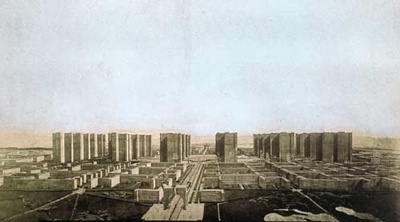 Interesting Fact: For a number of years French officials had been unsuccessful in dealing with the squalor of the growing Parisian slums, Le Corbusier thought this design was an efficient way to house large numbers of people in response to the urban housing crisis. 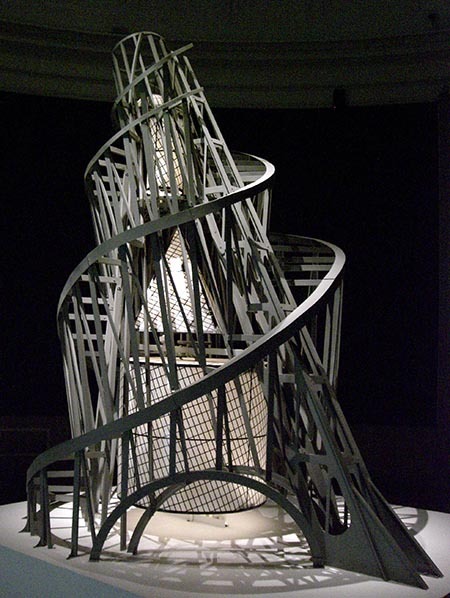 Tatlin’s Tower would have dwarfed the Eiffel Tower in Paris. The tower was to be built from industrial materials: iron, glass and steel. It was envisioned as a towering symbol of modernity. The tower’s main form was a twin helix which spiraled up to 400 m/1312ft in height, where visitors would be transported around with the aid of various mechanical devices. Interesting Fact: At the base of the structure was a rotating cube which was designed as a venue for lectures, conferences and legislative meetings. The cube would complete a rotation in the span of one year. Above that cube would be a smaller pyramid housing executive activities and completing a rotation once a month. 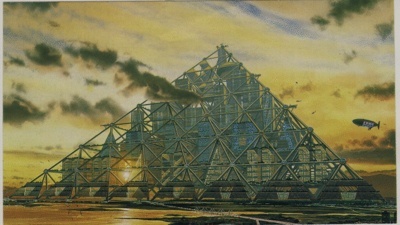 The Shimizu Mega-City Pyramid was a proposed project for construction of a massive pyramid over Tokyo Bay in Japan. The structure would be 12 times higher than the Great Pyramid at Giza, and would house 750,000 people. It would be the largest man-made structure on Earth. The pyramid structure would be composed of 55 smaller pyramids stacked five high. Each of these smaller pyramids would be about the size of the Luxor Hotel in Las Vegas. Interesting Fact: The reason this project can not be built is the design of the Mega-City Pyramids relies on the future availability of super-strong lightweight materials that are currently unavailable. This design is obviously more of a far fetched vision than a seriously considered project but I wanted to include it in this list because it’s really cool. Architect Eugene Tsui originally conceived the idea of the Ultima Tower as part of a study of the compact urban area of San Francisco. The structure would utilize atmospheric energy conversion by converting the difference in atmospheric pressure at the top and bottom of the structure into electrical power. The Ultima Tower is 500 stories tall (two miles high) and is intended to house one million residents. Interesting Fact: The structure’s shape is modeled after the tallest structure not made by man– African termite nests. 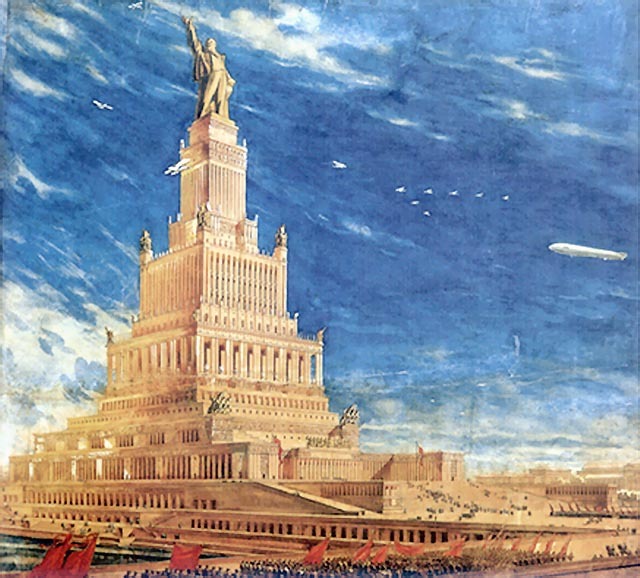 If the Palace of Soviets was built, it would have become the world’s tallest structure. It was to be built on the site of the demolished Cathedral of Christ the Saviour. A public international contest to design the Palace attracted 272 concepts from architects all over the world. The contest was won by Boris Iofan’s who literally expressed the idea of “Lenin atop the skyscraper” in the most clear form. Interesting Fact: Construction was actually started on this project in 1937 and was terminated because of the German invasion. In 1942 its steel frame was disassembled for use in fortifications and bridges. Also: The Cathedral was rebuilt in 1995-2000. 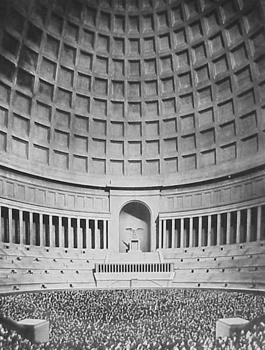 The Volkshalle (People’s Hall), was a huge monumental building planned by Adolf Hitler and his architect Albert Speer. It was to be the capital’s most important and impressive building in terms of its size and symbolism and the architectural centerpiece of Berlin. Thankfully the Great Dome was never built due to the break out of the war. 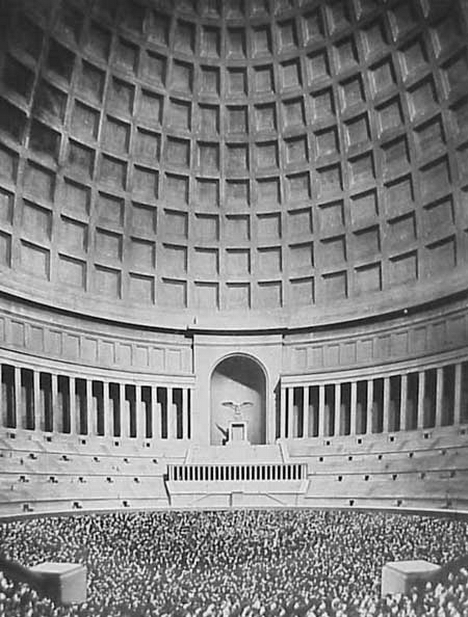 Interesting Fact: What makes the Volkshalle even more interesting is the illustration plans (pictured above) show a pedestal with the Nazi eagle figure. The eagle along with the pedestal and just the right shadowing gives an illusion in the form of Hitler’s face and is believed designed to appear only at a particular time of the year.